The EU supports candidate and potential candidates on their path to join the European Union. EIGE contributes to this process by supporting responsible authorities in their efforts to improve gender equality in the Western Balkans and Turkey in line with EU policies. By providing assistance to EU pre-accession countries, EIGE’s work is aiming to strengthen the capacity of Western Balkans and Turkey to develop gender equality policies aligned with EU priorities and better monitor gender equality progress. To achieve this, EIGE provides expertise and technical support on a diverse range of gender-related topics, including replicating monitoring methods and tools used in the EU, such as EIGE’s Gender Equality Index and Gender Statistics Database. 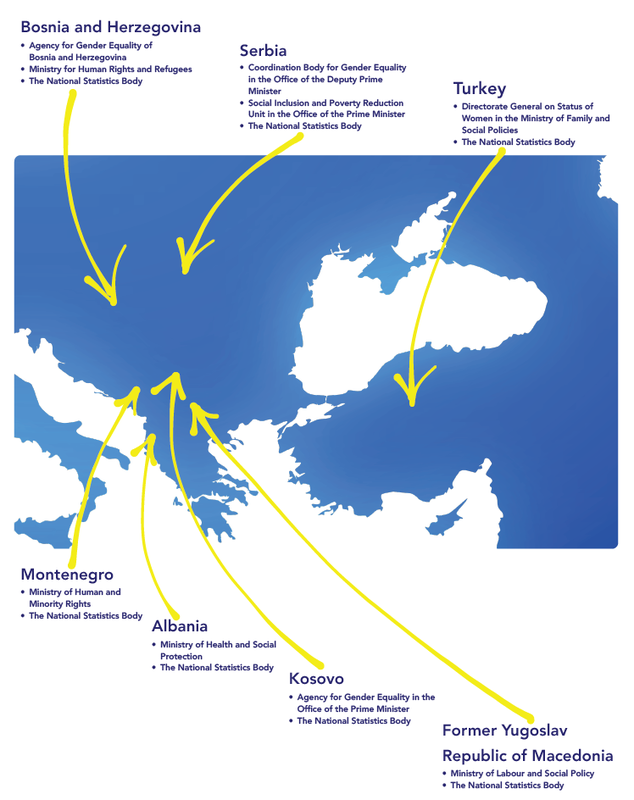 Within this project, EIGE works with the following EU candidate and potential candidates: Albania, Bosnia and Herzegovina, the Republic of North Macedonia, Kosovo*, Montenegro, Serbia, and Turkey. The main cooperation partners are the national bodies responsible for gender equality policies and national statistical offices. EIGE can also join up with other ministries and institutions, civil society, academia, gender equality experts and others. EU Delegations operating in the region. Organisation for Security and Cooperation in Europe (OSCE). Transparency: EIGE’s cooperation with EU candidate and potential candidates is transparent and inclusive. EIGE shares information through its regular communication channels. Country driven cooperation: The initiative for cooperation must come from the EU candidate or potential candidates with strong political commitment. For example, EIGE can support those that have expressed interest in developing a national Gender Equality Index. Expertise: EIGE provides expert support, such as knowledge on data collection on gender-based violence. Promote good practices on gender equality in the region. The European Union has a special programme for supporting candidate and potential candidate countries seeking to be members of the EU and who are already in the process of EU accession or negotiation. The programme is called the Instrument for Pre-accession Assistance (IPA) and is managed by the Directorate-General for Neighbourhood and Enlargement Negotiations (DG NEAR). Funds from the IPA programme are used for supporting these countries to implement necessary political and economic reforms before they join the European Union. As gender equality is one of the key principles of the European Union, EIGE works with EU candidate and potential candidates to build their capacity in the area of gender equality within this IPA programme.